ULTRA Warm. At -35C and lower, you will be surprised finding yourself warm, wearing a sweater/hat/socks hand-made of Tibetan Yak wool. Tibetan Yaks' undercoat is a precious fiber similar to Mongolian Cashmere. A premium quality Yak fiber micron count is between 15 and 17 microns. It is velvety, incredibly soft and supremely warm - even warmer than cashmere. The yaks' shed their coats and normally, it is gathered from the ground. The extremely fine yak's belly hair is usually combed out by hand, and then spun into yarn. Each yak produces about 100 gr of down (undercoat) fiber per year. China's Qinhai, Sichuan and Gansu Provinces are the major producers of the commercialized yak. 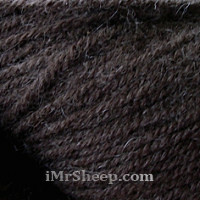 Lotus Tibetan Yak is a precious, pure, super soft, plied millspun yak wool in Natural Brown. It is undyed, and is suitable for hand and machine knitting. Note that the yak wool is not only amazingly soft and warm, but also also naturally moisture regulating. Garment Care: hand wash with woolwash "no rinse" or baby shampoo. Lay flat to dry, avoiding exposure to direct sunlight. 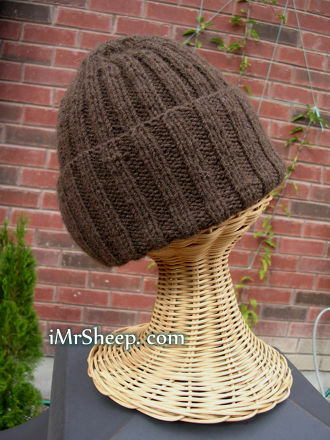 ULTRA WARM MEN'S HAT © IRENE & MR. SHEEP Co., knitted of 1x100g hank with 2 threads on 4.5mm circular needles (or please divide between 4 double points). Instructions: cast on 92 sts using 2 threads of the Lotus Tibetan Yak (make 2 approx. equal balls from 1 hank prior knitting) and 3.75mm circular needles for head circumference of 57-58cm. Knit 4 rounds in K2P2. Switch to 4.5mm circular needles, knit 24cm in K2P2. Shape crown: Round 1: K2, P2, K1, Knit2Together, P1. Rounds 2-3: Knit and Perl as per sts pattern. Round 4: K1, Knit2Together, P1, K2, P1. Round 5: Knit and Perl as per sts pattern. Round 6: K2, P1, K1, Knit2Together. Round 7: Knit and Perl as per sts pattern. Round 14: Knit2Together all sts. Cut yarn, draw it through rem sts and fasten off, or cast off rem sts using a crochet hook, and sew.